Well….we made it back. And unfortunately, I’m already back at work. No rest for the wicked, but at least we have a long weekend coming up. 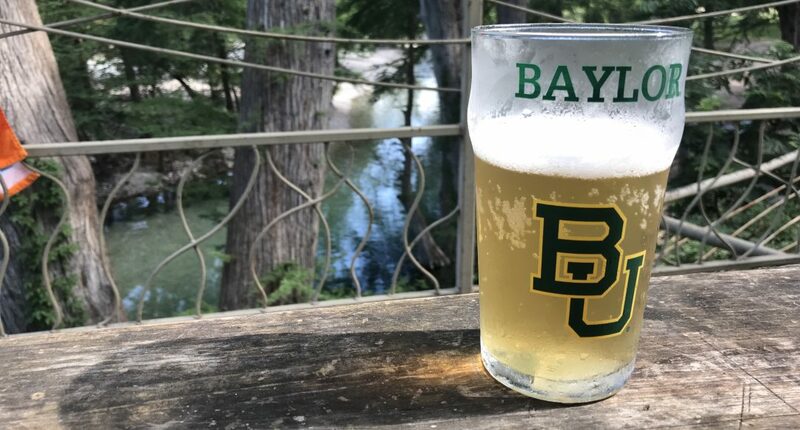 We had an amazing time, saw lots of cool things and tasted many new wonderful dishes, beers and apfelweins (think apple wine/cider), so I thought I would share some of them here for you. Here are just a few from the first day. First thing we had to do upon arrival was hunt down a SIM card for some phones that Mrs. G’s work gave us to use while we were there. They don’t have 3G or 4G, so we were stuck with some old phones and they needed cards to work. I don’t know the whole story as I wasn’t really paying attention. Work details and all and I was on vacation. Just along for the ride. After a train ride and going to a couple of stores, we managed to find the cards and I thought a beer was in order as a reward. 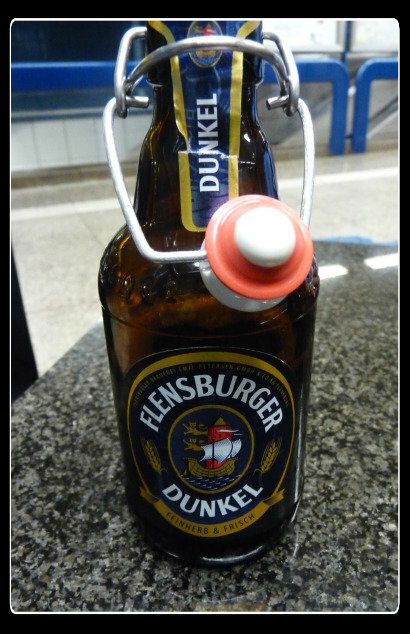 I got a Flensburger Dunkel, a nice dark beer that did not have a very strong taste. 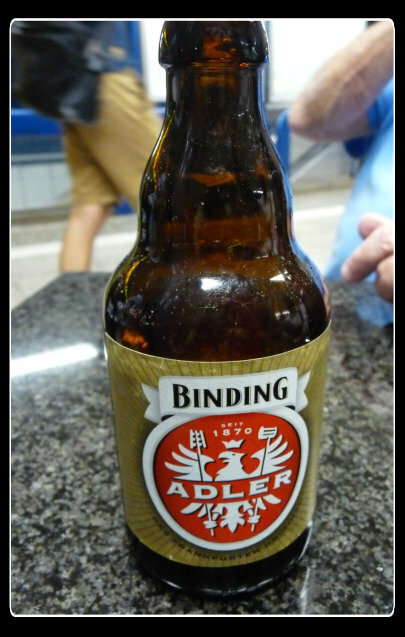 Mrs. G got a Binding Pilsner. Turns out it is brewed in Frankfurt and served EVERYWHERE. We ended up drinking quite a few of these over the trip. After our beers, it is was time to find another train and head back to Messe Frankfurt to help Mrs. G set up her show. Just ’cause I was helping, didn’t mean I couldn’t try another beer. I picked up this one at the show and let me tell you…it was NOT very good. Very bitter. I’m sure it was on the same quality level as Natty Light or the Beast. After setting up the show, it was off to find some dinner. 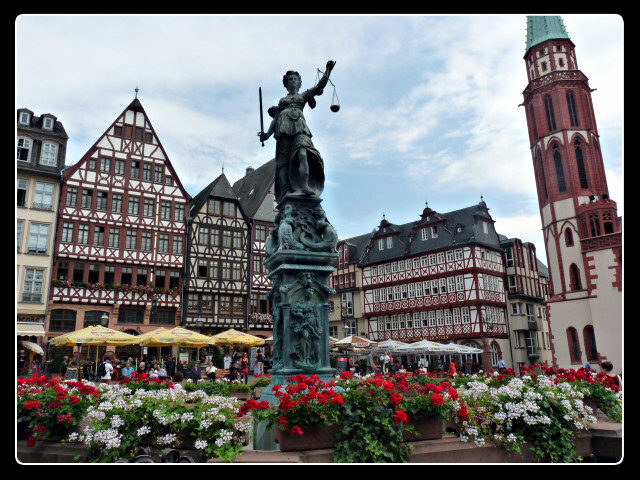 Some of Mrs. G’s co-workers have been to Frankfurt several times and wanted to head down to Romerburg Plaza to eat at Romer Bembel, so we tagged along with them. 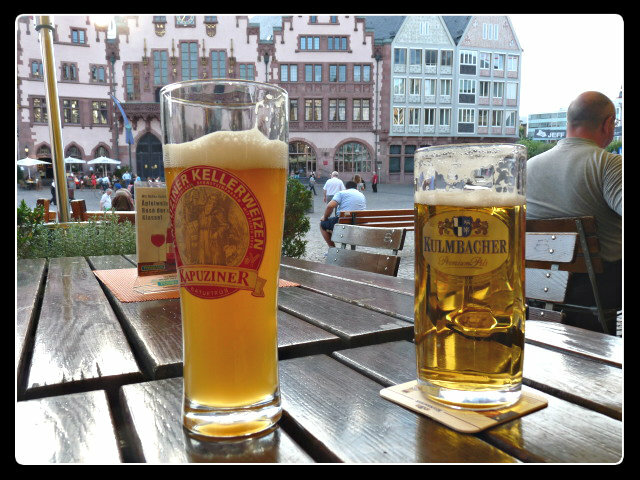 I had a very nice Kapuziner Kellerweizen (think Hefeweizen) while Ronnie (another husband who tagged along for the ride) had a Kulmbacher Pilsner. Ok…enough of beers. I’m sure you are ready to see some food. Ronnie opted for the Schniztel with potatoes and let me tell you it was wonderful. A schnitzel is a breaded pork cutlet that is dipped in flour, egg, and bread crumbs, then fried in butter or oil to a golden brown. It is traditionally served with a lemon wedge, which you can use to drizzle fresh lemon juice over the schnitzel. 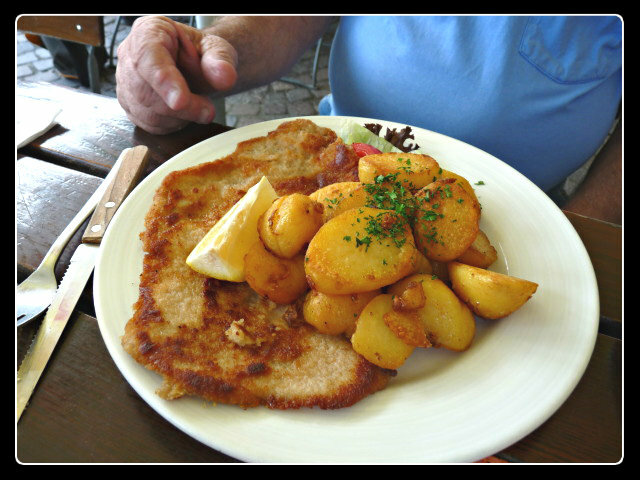 For those who are not so familiar with German cuisine … if you are in a German restaurant and do not know what to select off the menu, start with a schnitzel. You will not be disappointed. 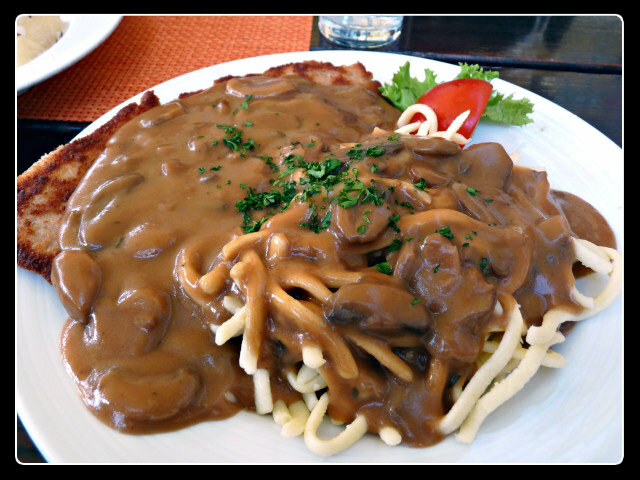 Mrs. G loves mushrooms (and spaetzle) so it was a no brainer that she opted for the Jager Schnitzel, which is a veal or pork schnitzel topped with a burgundy-mushroom or a creamy-mushroom sauce. Traditionally, this schnitzel is prepared without flour, egg, and bread crumb coatings. However, you will often find a breaded schnitzel topped with the sauce. I thought it was even better than the plain schnitzle. Being in Germany, I wanted sausage and opted for the Nurnberger Rostbratwurst (or just Nürnberger Bratwurst) which is a bratwurst from the city of Nürnberg. It is made from coarsely ground lean pork and is usually seasoned with marjoram, salt, pepper, ginger, cardamom, and lemon powder. Each bratwurst weighs around 1 oz. and it measures 3-4 inches in length. Let me tell you…..it was tasty. You just can’t go wrong with sausage in Germany (which we kept discovering throughout the trip). 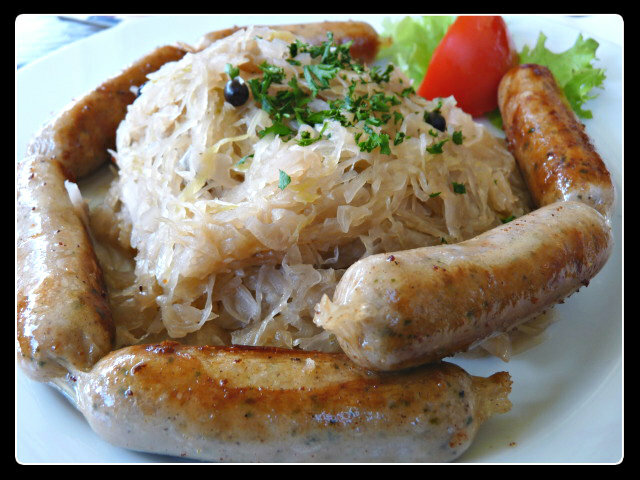 The sauerkraut on the other hand…..not so much. This sauerkraut is not what we’ve come to expect in the United States. It wasn’t very sour and in fact it was quite sweet. It hardly got touched. We did find sauerkraut later on in the trip that was similar to what we are used to, though. After dinner, we wandered around and checked out a few of the sites before finding a train back to our hotel. Stay tuned and I’ll share some more of our trip with you over the course of the following week, but make sure to check back here tomorrow as I have something quite special to share. Next: Next post: Chicken with Grilled Corn Salsa and a Birthday!! 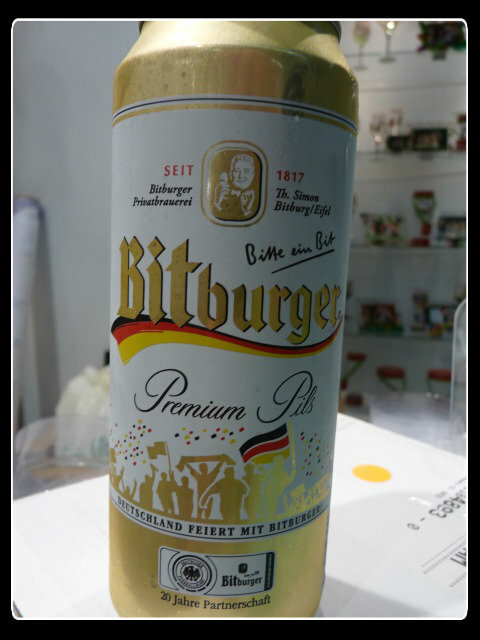 Have you ever noticed that the man on the Bitburger can looks like Bill Clinton? On a related (but non-German) note, the guy on the Sam Adams bottle looks identical to Capt. Piccard. Welcome home, bro! Everything looks delicious!!! Have a bunch of fun in Germany! Thanks Kayle, but we’re actually back already. My father was born and raised in Germany and he kept his love of the cuisine. He taught my mother to make German food and veal schnitzel was his favorite. When I came along, my fussy child palate didn’t like veal so my mother made chicken schnitzels which were and still are some of my favorite things to eat. Sounds like a fun “tag along” trip!